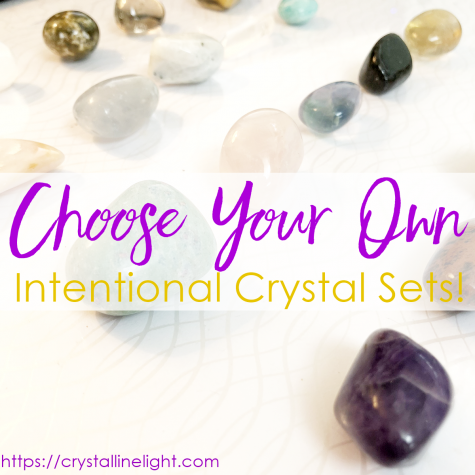 Created just for My Crystal Bliss and Crystalline Light, this set is curated with items for clearing and energizing your physical surroundings. You can use the items to clear the energies from your home or office, crystals or property, or use them in your sacred space to keep it energetically bright and vibrant. Most items are exclusive to the set and not available for purchase individually. The retail value of this set is $58! Selenite is a cleansing stone, especially for emotions, energy, and our homes. This is all about transformation and LIGHT. It keeps our spaces clear and bright, and because it is a self-clearing stone, never needs cleansing itself. Display this crystal in the center of your space that you wish to keep clear and sacred. Shungite is THE STONE for protection from EMF’s and environmental toxins. This stone is very cleansing and neutralizing for the body, mind, and spirit. It is safe to be placed in your water as a natural filter (note water will become clouded, however). It helps open our heart and evolve and integrate our true dreams. It is included in this kit for your personal use to stay clear and protected as you create your sacred space. White Sage is used to bless, cleanse and heal, as when it burns it will clear away influences or energy when you need a sacred space, clarity, or inner peace. Sage has been used in many traditions for centuries, and a scientific study in 2006 showed it clears bacteria from the air. Go here for instructions on use. 2 sticks of Palo Santo is used as an energetic purification of space (a.k.a. smudging) and meditation.The uplifting and pleasantly aromatic smoke enhances the vibration of any space, facilitates inner-creativity, and attracts positive energy for those open to its magic. Go here for instructions on use. This one of a kind SpaceClear Crystal Mist was created specifically for clearing your spaces ~ home, office, garden, car, as well as your body. It contains flower and gem essences, plus essential oils, (two very different things), combined with the intention to clear and release old or stagnant energies, bring the energy of the space back to its brightest, full potential. The mist will help allow in balance, clarity, and purity for mind, body, and spirit. There is NO other mist like this one, and is my most popular mist. Shake well before misting. Store in a cool, dry, dark area. These candles were designed by and made specifically for Crystalline Light. They are white candles, a blend of natural waxes, pure Peppermint essential oil, a Clear Quartz crystal, Reiki energy, and lots of love of course. Lovely candles to use for your sacred space or meditation time. They’re 2″ tall by 1 3/4″ wide. For safety, always place on a heat-proof plate or in a candle holder when burning. There are only EIGHT (8) of these sets available! Due to variations in crystals and tools, each set will vary slightly from what is shown.